happy (almost) three years, bay area! on june 6, 2015, i drove my car Frederick 300+ miles north to an area that I thought only contained San Jose and San Francisco. It became a place that was not only just those two cities, but also cold weather, Karl the Fog, expensive everything, actual public transportation, and different seasons! and three years later, The Bay Area is a place for me to now call home. In the past three years, I've had three jobs, gone to three different churches, and moved five times. I've spent more money than I'd like to admit on coffee and ice cream, scraped my car twice, lost at least 10 pounds (!! ), made some lifelong friends, and learned (still am) how to adult. But the past three years have been tough. It's home, but there are many, many days when I feel torn about being away from family. There are days when I feel lonely and feel like I don't belong, and there are days when I question whether or not being up here is the best for me. And there are better days, when I'm so incredibly thankful and humbled to be in the Bay. There are better days when I'm reminded of the community I have and the people I've met who've changed my life more than they'll ever understand. There are better days when I'm reminded that He is faithful and has faithfully brought me to where I am now and will continue to do do all things for my good. so, tl;dr: Bay Area, Yay Area - you rock my socks. This matcha mochi cake has absolutely nothing to do with my bay-aversary, but I guess now it will be forever associated with this milestone. I've actually made this recipe multiple times over the past month alone - and I've had more people ask me for this recipe that any other thing I've baked. So, you know it's a keeper because it's the bomb-diggity. If you don't know what mochi is, let me direct you to wikipedia, the website where you know you're getting the best possible information (ayyyyyy). But basically, mochi is a Japanese rice cake made of sweet rice flour. There are different types of mochi to make; the one in this post is one of the easier ones, in my opinion. Make batter, pour batter into pan, bake, slice, eat, repeat. Easy enough, yes? 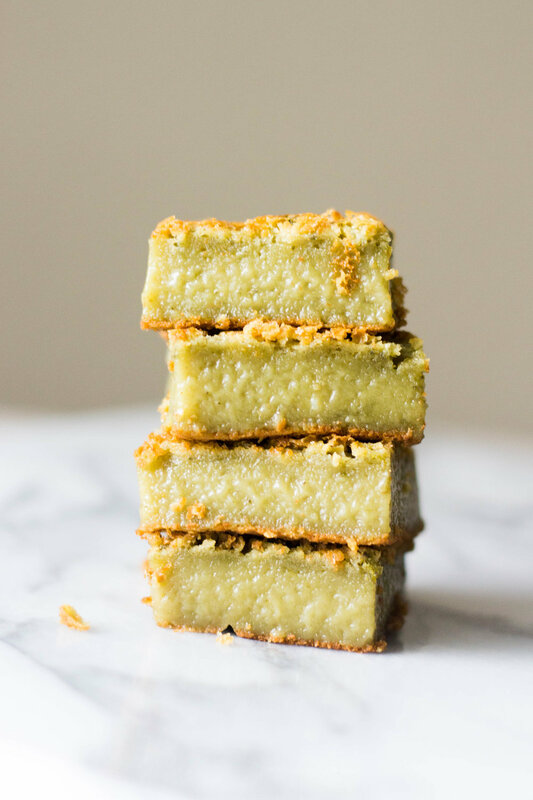 The result is a slightly sweet and very chewy cake with a hint of matcha. There is almost no crumb for this cake, just a couple from the crispy top. It's "dense and gummy in a good way," as the original poster writes, and absolutely delicious, says me and everyone else who's eaten this. baker's notes: i haven't tested the other variations yet, but I'm hoping to get to it one of these days. if you want, a handful of dried sweetened coconut would be a good topper- just sprinkle over the cake once you pull it out of the oven. Sweet rice flour usually comes in 1 lb. packages - the three cups in this recipe is just a little less than half a pound. preheat oven to 350 f. Line a 9x13-inch pan with parchment paper. in a large bowl, beat together the melted butter and eggs until smooth. stir in the evaporated milk, coconut milk, and vanilla extract until combined. set aside. in a medium bowl, whisk together the rice flour, granulated sugar, baking powder, and matcha powder. add the dry mixture into the wet mixture, and stir until no more flour streaks remain. The batter will be thick; don't over mix. pour the batter into the prepared pan. bake for 60-70 minutes, or until a toothpick stuck in the center comes out clean and the edges have browned slightly are starting to peel away from the sides of the pan. It'll probably still be jiggly! Let the mochi cake cool completely before slicing into squares. enjoy! !